July 2, 2017 — 75 Christian, Jewish and Muslim youth from around the world gathered at the Hebrew University of Jerusalem for a unique summit, in answer to Pope Francis’ call to create a culture of encounter for peace. 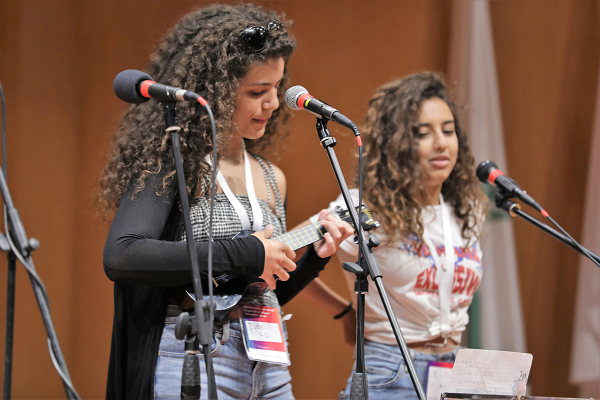 Students ages 15 and 16 from Argentina, Brazil, Burundi, Congo, Kenya, Mexico, Spain, and other countries joined their Palestinian and Israeli counterparts for four days of learning through arts, sports, technology, and living together. At the opening ceremony, young people expressed their hopes for peace through a variety of artistic presentations. 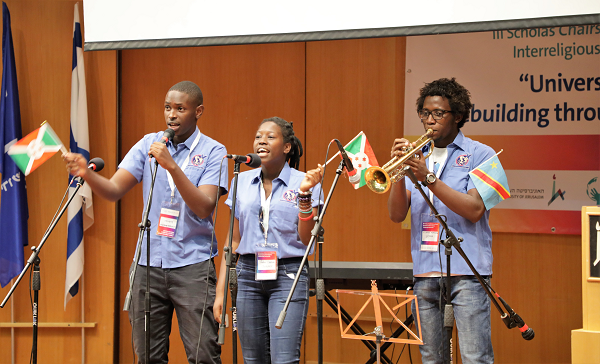 Students from Burundi and Congo performed a song in Swahili; Palestinian students from Beit Hanina performed “Imagine” by John Lennon, and Israeli students from the Jerusalem Academy of Music and Dance sang of peace in Hebrew. Three senior religious leaders, representing the three Abrahamic faiths, gave opening benedictions as part of an interreligious prayer for peace: Kadi Iyad Zahalka, The Kadi of Jerusalem and the Head of the Sharia Courts of Israel; His Eminence Mons. Giuseppe Lazzarotto, Apostolic Nuncio to Israel; and Rabbi Dr. Shlomo Dov Rosen, the Rabbi of Yakar Congregation in Jerusalem. The closing ceremony on Wednesday, July 5 is expected to include greetings from Pope Francis, together with the planting of a traditional olive tree for peace in his name, as students describe their experiences and present their works of art and their social projects. 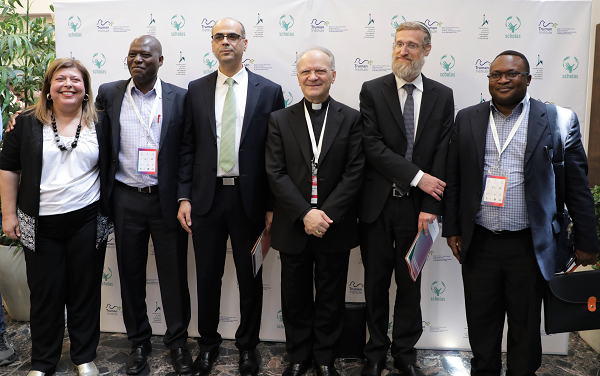 Among the dignitaries present representing Scholas Occurentes were José María del Corral, President of the Pontifical Foundation Scholas Occurrentes; and for the Holy See, His Eminence Mons. Angelo Zani, General Secretary of the Congregation For Catholic Education and His Eminence Mons. Marcelo Sánchez Sorondo, Vice President of Pontifical Foundation Scholas Occurrentes and Great Chancellor of the Pontifical Academy of Sciences. Attending from the Hebrew University were Professor Menahem Ben-Sasson, President; Professor Asher Cohen, Rector and President-elect; Amb. Yossi Gal, Vice President for Advancement and External Relations; and Ms. Naama Shpeter, Executive Director of the Truman Institute and Conference Chair. Scholas (http://web.scholasoccurrentes.org/en) is an international educational organization created by Pope Francis when he was Archbishop of Buenos Aires, which was adopted as a global youth project of the Vatican, to educate young people in the commitment for the common good. The Truman Institute (http://truman.huji.ac.il) is the first and largest research institute in the Middle East to examine conflict resolution and propose peaceful solutions for the region, and fostering discussion and understanding on the challenges facing Israelis and Palestinians and the citizens of the developing world.